Christie Mims is a professional certified coach who built her coaching business, The Revolutionary Club, into a Forbes Top 100 site for careers. After serving over 1,000 paying clients she got a ton of questions on how she did it, and Coach Pony was born! 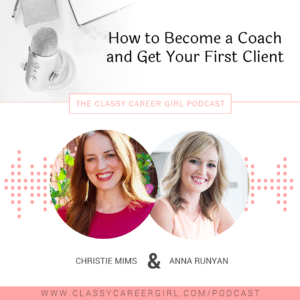 Because career happiness sometimes comes with a side of entrepreneurship, Christie has a passion project for new and struggling coaches, she is dedicated to giving them the information and community they need to succeed. How do you know if you are really ready to be a full-time coach? Do you need a certification? How do you get started? What are some steps to take to build your coaching business? How do you stand out when there are so many other coaches out there? How do you get paid and package your services? What are some mistakes new coaches make? What are the important things to think about before you quit your day job?